Screenplay: Michael Mann, Ronan Bennett, Ann Biderman. 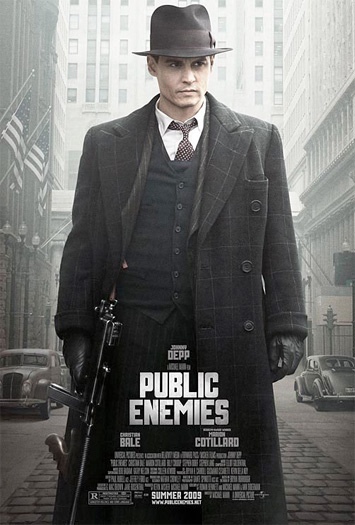 Starring: Johnny Depp, Christian Bale, Marion Cottilard, Stephen Graham, Giovanni Ribisi, Channing Tatum, Stephen Dorff, Billy Crudup, James Russo, David Wenham, Carey Mulligan, Rory Cochrane, Casey Siemaszko, Lili Taylor, Shawn Hatosy, Stephen Lang, Leelee Sobieski, Emilie De Ravin, John Ortiz, Jason Clarke, Don Harvey, Matt Craven. Director Michael Mann tackles the 1930’s gangster picture with the real life story of John Dillinger, famous bank robber and No: 1 on the F.B.I’s most wanted list. Mann’s attention to detail and intricate stories, involving numerous characters have worked a treat in the past (“Heat”, “The Insider”) but with this he delivers an absolute mess. 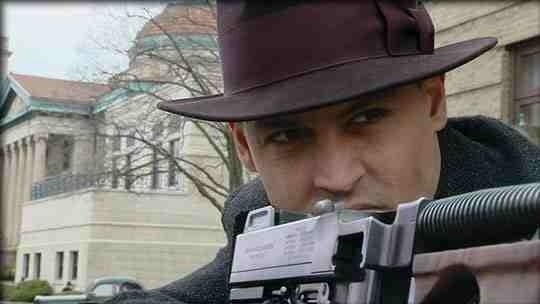 Depp can play weird and wacky roles in his sleep but as hardened, charismatic gangster Dillinger, he is seriously miscast. Christian Bale also looks lost in a thankless role. Although the look and feel of the film are spot on, the script is all over the place with characters appearing, then disappearing, without explanation and too much time was spent on Dillingers relationship with his girlfriend Billie and not enough time spent on what made him tick. With “Heat”, Michael Mann delivered one the best “cops & robbers” films of recent times and with “Public Enemies” and fedoras, gangsters and tommy-guns, I expected more of the same. Sadly, nobody delivers in this one. This entry was posted on January 24, 2012 at 12:34 pm and is filed under Biography, Crime, Drama, thriller with tags 2009. You can follow any responses to this entry through the RSS 2.0 feed. You can leave a response, or trackback from your own site.